"The iBook, overall is a fantastic low end laptop. It isn't horrifically expensive, but reasonably powerful and stays true to the idea that a laptop should be a portable machine. However, there are a good number of those who purchased an iBook a year or so ago that are finding their machines as very large paperweights. Why is this? Faulty motherboards. "So if you have an iBook that is rapidly approaching the end of its 1 year warranty, and you haven't bought your AppleCare warranty - you may want to. Of course if you do, you'll probably be spared the death of two motherboards in three months or maybe not. Too bad Apple hasn't decided to take a more appropriate course of action to fix this problem. If it only happened to a couple of people, no one would care. But when it seems fleets of iBook have gone bad like this, there is a problem." As the owner of a nine month old iBook that has so far been flawlessly reliable, I have a more than casual interest in how widespread this problem is. AppleCrap isn't the only Mac Website that has sounded the alarm over this issue. My Road Warrior column this week on MacOpinion addresses the conundrum of whether to purchase AppleCare extended warranty coverage or not, particularly if you own an iBook. Newer Technology Inc. and Other World Computing have introduced a new line of high-capacity batteries designed for Apple's PowerBook G4 and G3 models. The NuPower line of Lithium Ion batteries from Newer Tech offer up to 30% more capacity than stock PowerBook batteries - and at prices as low as $139.99. "The NuPower batteries set a new standard for battery life for G4 and G3 users everywhere," said Larry O'Connor, president of OWC. "Everyone knows that battery life is a very critical aspect of successful on-the-go computing. Whether you'd like to replace an older battery that just isn't performing like it used to or are in the market for a spare, our NuPower Li-Ions deliver the longest run times of any stock replacement batteries available today." The NuPower Li-Ion G4 Titanium Battery works with all 15" PowerBook models (400 MHz to 1 GHz) and delivers 14.8 volts and 4400 mAh, providing 65 watt-hours and making it the longest lasting PowerBook G4 battery available today by as much as 30% compared to the original battery. Retail price: $139.99. NuPower Li-Ion G3 Batteries for G3 Lombard (1999/Bronze Keyboard) and G3 FireWire (2000/Pismo) PowerBooks are 10.8 volts and 5400 mAh, providing 12.5% more capacity versus stock Lombard and FireWire batteries. Retail price: $149.99. The NuPower Li-Ion G3 Battery for G3 WallStreet (1998/Black Keyboard) series PowerBooks delivers 14.4 volts and 4500 mAh, providing 25% more capacity than the stock Apple WallStreet Battery. Retail price: $139.99. "You really don't think about your laptop battery until you need to," O'Connor said. "It's when you're dimming your screen and engaging every last power-saver mode to get those extra minutes that you're wishing your battery lasted longer. In those situations our NuPower batteries come in mighty handy." Newer Tech NuPower batteries are available through OWC and at other fine resellers in the United States and around the globe. Willow Design has released a line of handbags for the 12" PowerBook and iBook that match its sixteen year tradition of superb protection and function with the style of an internationally inspired handbag. Four different handbags feature removable 12" PowerBook or iBook sleeves, along with pockets for paperwork, personal items, accessories, and two key chains plus a business organizer panel. "My initial reaction is 'very cool.' It doesn't look as big on the outside as it really is on the inside. I 'wore' the handbag and asked my husband what he thought and he said, 'Sleek.' He said it didn't advertise the fact that I was carrying a computer. It can definitely pass as a large handbag," said K. Puckett of Maryland. Similarly, S. Kostman of Illinois remarked, "I like it very much. It gives the appearance of a woman's sling bag or tote. I used it this morning, and I was able to fit my small purse in the bag along with my 12" PowerBook. In fact, I really don't need to carry a separate purse at all. Everything can fit in the bag! One last thing . . . I like the exterior design. It is simple and stylish and looks very professional without being overwhelming." Elegant, clean, and very stylish handbag style exterior. Light weight for maximum carrying comfort. Carrying comfort assured by a wide integrated padded shoulder strap. Accentuated security for your laptop by a handbag style that doesn't advertise it's holding a laptop. Excellent protection for your iBook or PowerBook afforded by a specially designed sleeve with 0.6 cm (0.3") soft "gushy" foam reinforced by high density polystyrene reinforcement on all sides. Removable computer sleeve with its own shoulder strap for times when you want to carry only the 'Book. Exterior 600 denier polyester and interior 200 denier nylon both of which are urethane coated for waterproofedness. The fabrics give an excellent balance between superb protection and durability and light weight. Extra carrying comfort for extra long or heavy loads is provided by an extra wide foam padded shoulder cushion which can be secured to the shoulder strap top. Contoured, thickly padded shoulder strap with a special sticky bottom to keep it on your shoulder. Integrated organizer panel with pockets for business cards, pens, pencils, cellphone, iPod, notepad, etc. Convenient zippered accessory or make-up pocket. Smaller accessory item and change pockets on side. Two separate, removable keychain clips for home and office, or house and car key separations. Zippered inside of outer wall pocket for paperwork, letter sized folders or other items. The Suva 12" iBook Handbag safely and efficiently carries your iBook, while also doubling as a stylish and sophisticated professional bag. The handbag is lightweight but offers a range of pockets for business items, computer accessories, make-up, change, and other items. Fits: 12" iBook. A 30" shoulder strap makes it most suitable for shorter or smaller framed persons. The Brefa 12" PowerBook Handbag fulfills the roles of a stylish handbag plus a highly protective 12" PowerBook carry bag. The handbag is lightweight but offers a range of pockets for business items, computer accessories, make-up, change and other items sorted out. Fits: 12" PowerBook. A 30" shoulder strap makes it most suitable for shorter or smaller framed persons. The Plesa 12" iBook Handbag is the same as the Suva Handbag but with a shoulder strap two inches longer for taller or fuller framed persons. As with the Suva, it helps to simplify professional life by combining the needs of a laptop case and personal handbag. Fits: 12" iBook. Its 34" shoulder strap makes it most suitable for taller or larger framed persons. 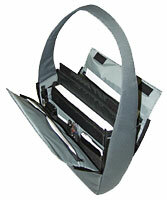 The Lief 12" PowerBook Handbag functions superbly as a handbag and as a protective laptop case. The bag component duplicates the Brefa but offers the longer shoulder strap for larger persons. Fits: 12" PowerBook. Its 34" shoulder strap makes it most suitable for taller or larger framed persons. The handbags are available in black, charcoal, navy, burgundy, and taupe and feature Willow's lifetime guarantee against defects in materials and craftsmanship. 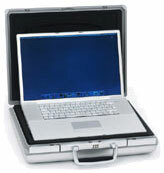 TiCase has been updated for the 17" version of the PowerBook G4. While this laptop is structurally robust, its sheer size makes it vulnerable to twisting in conventional soft laptop bags. The TiCase has long been identified as the ultimate in style, elegance, performance, and protection. The TiCase is ideal for the sophisticated traveler. These cases may look sleek and satin-smooth, but they're also tough and durable, with a brushed aluminum shell, combination lock, and an interior that combines elegance with ease of use. The TiCase is built with precision to hold all of your laptop essentials. The closed cell foam padding has cutouts for securely stowing power adapter, cables, and your iPod. There are additional compartments for other items as well, and the accessory compartments are covered to keep everything in place. A fully loaded TiCase (including PowerBook and a full complement of accessories) weighs in at less than 15 pounds. TiCase sports a skin of brushed aluminum. The size, shape, and color perfectly complimenting the PowerBook G4. TiCase includes 2" of closed cell Styrofoam that provides the necessary protection. Lift off the lid, press gently on the rear corners of the TiCase, and your trusty laptop glides into working position. The "Lift-o-Matic" telescopic feet raise the rear of the TiBook so that the natural decline of your knees is properly balanced and the TiBook comes to a level rest at desk height. As a side effect, Lift-o-Matic makes room for ample air circulation under the TiBook which helps it run cooler and more quietly. With the Lift-o-Matic engaged, the ports at the rear of the TiBook are accessible, whether you need a mouse, additional monitor, power, a network connection, or FireWire. ATI Technologies Inc. has announced that the Mobility Radeon 9600 mobile visual processor, which uses advanced 0.13-micron technology, is now shipping in Apple's newest 15" and 17" PowerBook G4 notebooks. "The Mobility Radeon 9600 drives incredible realism in the most advanced games and latest 3D workplace applications," said Phil Eisler, Vice President and General Manager, Mobile and Integrated Business Unit. "We have once again delivered a mobile VPU that offers immersive 3D environments, cinematic realism and earth-shattering performance to PowerBook notebook users - ATI is truly the driving force behind the mobile planet." "The all-new 15" PowerBook with its sleek aluminum design and high-performance architecture offers the ideal balance of power and portability, while the 17" PowerBook provides mobile professionals with the largest display available in a notebook computer," said Greg Joswiak, Apple's vice president of Hardware Product Marketing. "The ATI Mobility Radeon 9600 graphics processor delivers revolutionary 3D performance with vivid, cinematic quality graphics that enable PowerBook customers to do studio-quality work on the go." The Mobility Radeon 9600 enables digital content creators (DCC), graphic designers, video editors, power notebook users and gamers to experience Smartshader 2.0 graphics on a mobile platform at full speed, with full image quality and color precision for both work or play without compromise. It also supports a comprehensive array of external display options including Apple's all digital 23" flat-panel Cinema HD Display and provides hardware acceleration for multiple video formats. QuickerTek, developers of PowerBook antennas for Titanium PowerBooks and external antennas for both the Graphite and Snow wireless base stations, is now shipping their AntennaKit, an external antenna that works with Apple's Snow and both versions of Apple's Extreme Airport Base Stations. The AntennaKit typically increases signal strength up to 50%, increases line-of-sight distance by an average of 250 yards, and makes it easy for users to install their own antennas, even on base stations that do not provide external antenna ports. The price of the AntennaKit is $129. The kit includes a 5Dbi Omni directional antenna along with the necessary connections, brackets, and illustrated installation instructions. Installation in Snow Base Stations requires drilling a small hole in the cover (a hole guide is provided in the kit). "Customer's who bought our existing Base Station antennas have been thrilled with the performance improvements," said Rick Estes, President of QuickerTek. "However, they either had to send us their Base Stations for upgrading or they had to reprogram the upgraded one we sent them - now with our AntennaKit, they can easily and quickly install the antenna, greatly increase their performance and they don't need to reprogram anything." QuickerTek recommends that owners of Titanium PowerBooks purchase a Whip Antenna either along with their AntennaKit or prior to buying the kit. Bernice, a recent QuickerTek customer, writes, "I think the Whip Antenna is terrific. It makes my AirPort card usable at last. I get a very strong signal!" Couple the Whip Antenna with the Base Station AntennaKit and the results are truly impressive. The website has a chart with performance data. CSR (Cambridge Silicon Radio), a market leader in Bluetooth silicon, today announced that Apple has selected CSR's BlueCore chips with Adaptive Frequency Hopping (AFH) to Bluetooth-enable its line of PowerBook G4 notebooks. Apple offers its PowerBook G4 customers Bluetooth wireless technology to easily enable wireless exchange of data between other Bluetooth-enabled devices including computers, cellular phones, PDAs, and the new Apple Wireless Keyboard and Wireless Mouse. The BlueCore chip offers AFH, a system that eliminates interference between Bluetooth and other RF devices, such as WiFi (802.11) that operate in the 2.4 GHz radio frequency band, by coordinating the frequency channels of all 2.4 GHz devices. As the number of computers fitted with both Bluetooth and WiFi wireless connectivity increases so does the value of AFH. Interoperability prototypes were made available first by CSR and were used by the Bluetooth lead adopters including Apple to validate the new AFH standard. "Apple has lead a number of introductions of communications technologies to the personal computer world including Ethernet, AirPort (802.11b) and FireWire (IEEE 1394)," said Glenn Collinson, Sales Director & Co founder, CSR. "Apple's integration of Bluetooth into their computers will likewise accelerate its mass market adoption and CSR is delighted to be supplying Apple's computer division with Bluetooth ICs for its PowerBook G4 notebooks." "Apple was first to integrate Bluetooth into its operating system with Mac OS X and now the first to make it a standard feature across our entire line of professional notebooks," said Greg Joswiak, Apple's vice president of Hardware Product Marketing. "We've worked with CSR to be first to deliver adaptive frequency hopping to our PowerBook customers to provide an exceptionally reliable and interference free wireless experience." CSR's BlueCore silicon was the first single-chip to provide Bluetooth functions, and, alongside the development and implementation of AFH, demonstrates the progressive approach that CSR has taken with its technology. CSR's technology and the ability to deliver in high volumes are important deciding factors when companies like Apple are looking for quality Bluetooth solutions. CSR (Cambridge Silicon Radio) is a leading provider of single-chip radio devices for Bluetooth wireless communication. CSR offers developed hardware/software packages based around BlueCore, a fully integrated 2.4 GHz radio, baseband and microcontroller. BlueCore features in 60 percent of all qualified Bluetooth v1.1 enabled end product designs with international names such as Microsoft Corp, Panasonic, Audi, NEC, Toshiba, Samsung and Sony already using BlueCore in their range of Bluetooth products. In June 2003, CSR launched the third generation BlueCore devices with full support for v1.2 of the Bluetooth specification. CSR is headquartered in Cambridge, UK, with offices in Richardson, Texas, USA; Tokyo, Japan; Singapore; Seoul, Korea; Taipei, Taiwan; and Aalborg, Denmark. You got rid of that huge CRT monitor, but now your keyboard is eating up your workspace. The solution is to park your keyboard on the iRac when your computer's not in use and enjoy a tidy desk - write letters, sketch, pay bills, and put your feet up. The iRac is made of solid steel and finished with a white powder coat paint that matches the iMac or iBook computers. Each end is covered with a rubber cap to protect the keyboard. This design rests perfectly on any G4 flat screen iMac. "Notebooks are gaining in popularity with consumers and businesses, and more people use them as their primary computer. But the characteristics that draw people to notebooks, such as their small size, result in undesirable features, such as fixed keyboard and screen positions, which aren't always as comfortable to use for hours on end." "The second ThinkPad prototype has a special double hinge that allows the keyboard to tilt upward and slide forward for more comfortable typing. The height of the display simultaneously rises by about 3 inches. The keyboard does not detach, however...."
LaCie will begin shipping a new lightweight, ultra-portable DVD±RW drive designed by the talented team at Porsche Design GmbH at the end of September. The agency is known for creating striking designs for objects as various as motorcycles, cameras, lamps, sunglasses, furniture, street lighting, and tramways. Porsche Design evokes a style based on purity, simplicity, and elegance, the subtle balance of function and form. This all-in-one drive combines four DVD formats in a slender, handheld device, affording customers the benefits of DVD recording while on the go. LaCie's first mobile device to combine DVD-RW and DVD+RW technologies, this drive comes equipped with FireWire or Hi-Speed USB 2.0 interface for easy connection to any PC or Macintosh. Featuring a slim, travel-sized body, the LaCie Hi-Speed USB 2.0 Slim DVD±RW Drive is ideal for use with notebook PCs, and for a variety of applications including backing up files on the road, sharing information with clients, or transferring data from home to the office. The included software package also allows customers to create and view personal DVD-Video discs. The LaCie FireWire Slim DVD±RW Drive comes complete with a comprehensive software suite that includes CaptyDVD for Mac for creating professional-quality, interactive video DVDs. Using the power provided by the FireWire bus, this drive can operate without an AC adapter, providing further mobility when travel is required. Also available is the LaCie Slim Combo CD-RW Drive with fast Hi-Speed USB 2.0 connection. With 24x write speed, this drive lets you record a full disc in a little more than three minutes, and is capable of reading standard DVD-ROM discs. This drive also comes with an MPEG-2 decoder for viewing DVD-Video discs. The LaCie Slim DVD±RW Drive is available at prices starting at $349. A software suite will ship with the Hi-Speed USB 2.0 LaCie Slim DVD±RW Drive that includes Sonic™ MyDVD Video Suite, ArcSoft ShowBiz®, InterVideo WinDVD, and Roxio Easy CD Creator Basic. A software suite will ship with the FireWire Slim DVD±RW Drive that includes CaptyDVD, and Roxio Easy CD Creator Basic and Toast Lite for Mac.